We design, manufacture and deliver one of a kind products which solve your dangerous goods storage problems. 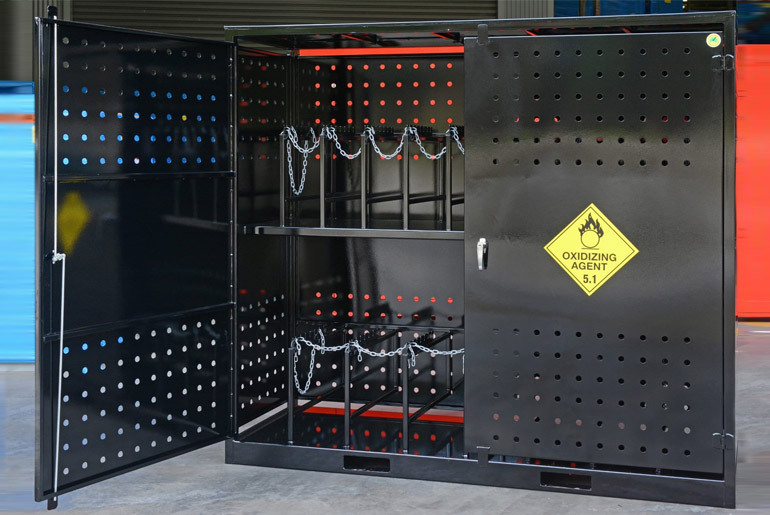 STOREMASTA dangerous goods storage solutions are fully customisable. All features can be designed specifically for your specific needs. Speak to a STOREMASTA dangerous goods consultant to outline your goals, challenges and custom storage requirements. Following this discussion, our expert team will develop a product concept for storing and managing your dangerous goods. 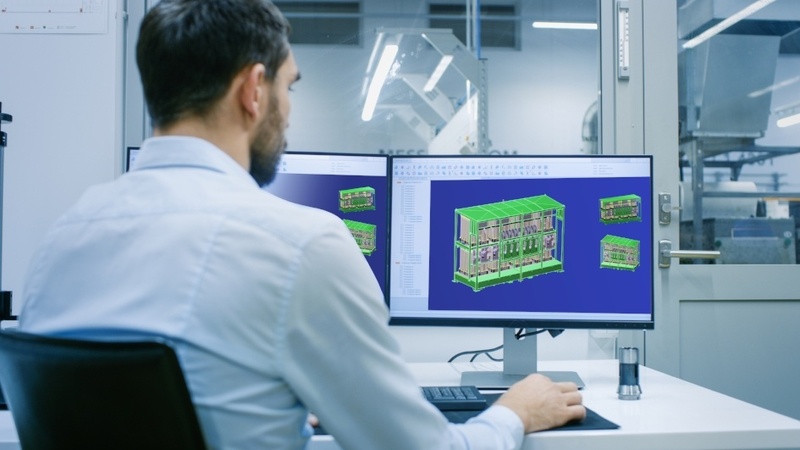 Once the concept is presented, tweaked and signed off, we manufacture your solution at our Australian plant and deliver it right to your site. Our expert team manufacture unique storage solutions to maximise compliance and efficiency. We’ll work with you to design, manufacture and deliver a compact, safe dangerous goods storage solution for your worksite. 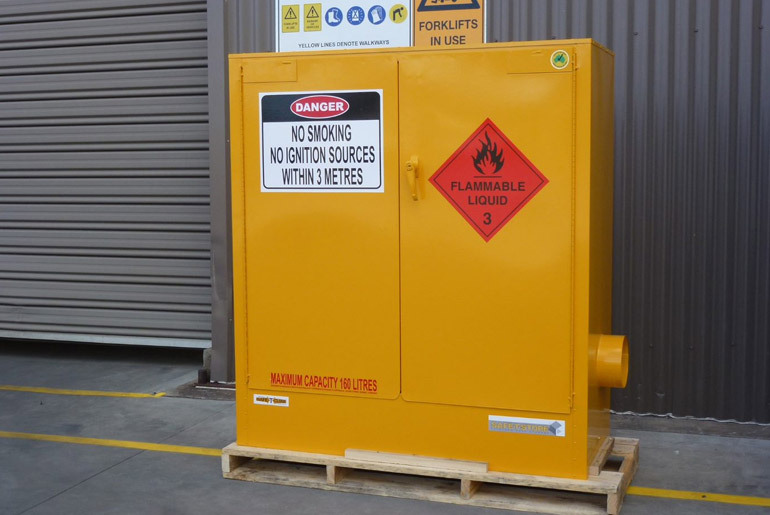 To keep highly volatile flammable vapours below the workplace exposure standards, STOREMASTA manufactured a custom flammable cabinet with a 150mm vent port. This larger vent port allowed a high velocity ventilation system to be installed on the cabinet, which was essential for reducing the concentration of flammable vapours within the cabinet. A healthcare organisation required a bulk storage solution for D & C sized oxygen gas cylinders. The storage solution needed to be compact, durable and compliant with the stringent dangerous goods storage regulations. STOREMASTA’s engineers engaged with the client and developed a custom gas bottle cage to meet their specific gas cylinder storage requirements. One of STOREMASTA’s clients required a storage solution to contain multiple drum sizes in a confined location. 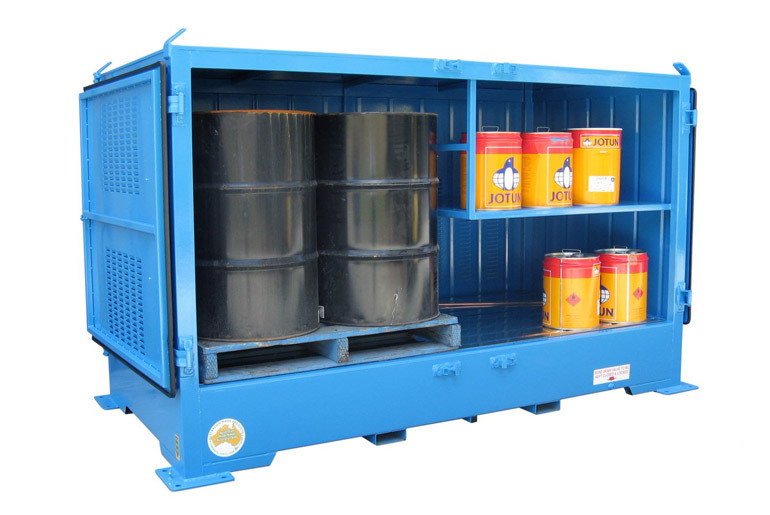 To meet their specific dangerous goods storage requirements, STOREMASTA designed and manufacture a custom outdoor chemical storage container that allowed the client to efficiently store different sized packages in the same storage facility. A client who managed a fleet of helicopters required a compliant flammable liquids storage facility for a remote location. This remote location had no mechanical lifting equipment. To solve their specific flammable liquids storage requirements, STOREMASTA designed and manufactured a single level storage facility with a low-profile bund. This storage solutions allow the client to easily transfer large drums in and out of the store and it also complied with regulations.